Scientific International, New Delhi Welcome to Scientific International, New Delhi, a reliable manufacturer & exporter of an assortment of laboratory, scientific and medical instruments.Established in 1999, we are an ISO 9001:2000 certified proprietorship firm. Our products are in compliance with GB/T5453-1997, ASTM standards. We also offer prompt and efficient after-sales support services. We are known for timely delivery, offering customized solutions and possessing well equipped warehousing facility. Our range of products includes Laboratory, Analytical, Biology Lab, Biotech, Physics Lab and Geological Electronic Instruments. 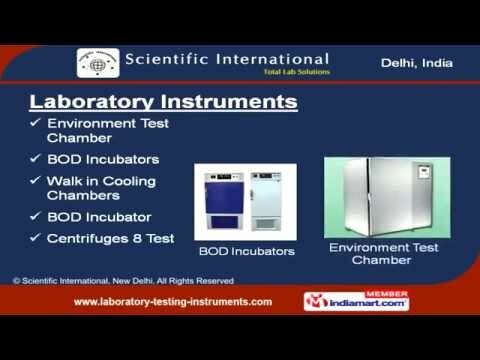 Under the Laboratory Instruments section, we offer Environment Test Chambers, BOD Incubators and many more. Our variety of Analytical Instruments includes FTIR / FTNIR Spectrometers, Microplate Readers and other similar products. We also offer a range of Paper Testing Equipment, such as Box Compression and Bursting Strength testers. Our Biotech Instruments include Atomic Absorption Spectrophotometers, Biochemistry Analysers, BOD Test Kits and Brookfield Viscometers. In addition, we offer Geological Electronic Instruments like Electronic Total Stations and Theodolites.